Looking for a way to make extra money? 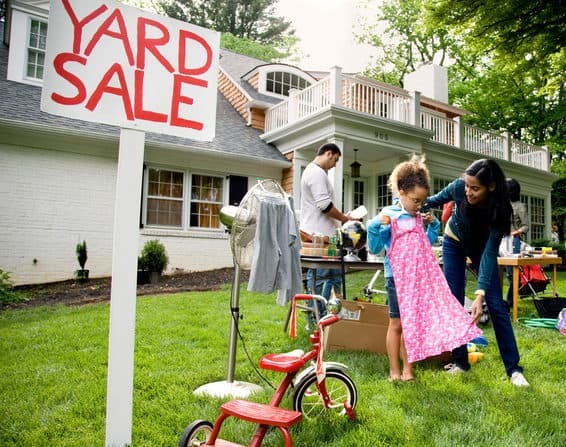 A yard sale (or garage sale) can provide a great opportunity to generate revenue and clear out some of the old, but sellable items. In order to be successful, you’ll need to do some proper planning. Listed below are a few Mindful tips that can help. Schedule with care. Before planning a yard sale or garage sale it’s important that you do your research. Try checking the weather forecast to find the best, rain-free day. Beware that some U.S. towns require permits for yard sales or garage sales. If your merchandise lacks variety or if you need some help, consider asking neighbors, family, or friends to join you. Advertise the right way. Posting up signs at busy intersections and in community centers is a good start. Also, consider buying an ad in the newspaper. Or for free advertisement, consider posting your yard sale information on social sites like Craigslist. You can also post information in local stores or on a community website. Stock up on supplies. There are a few things you’ll need for the yard sale like plenty of change (both in coins and dollar bills). Consider getting a cashbox to keep your money safe. You’ll need tables for display, maybe a few chairs and a rack for clothes. Also, consider having some newspaper to wrap delicate items and bags to hold the purchases. The price is right. When pricing your goods it’s important to keep the actual value (not your personal sentimental value) in mind. Also be sure that everything is priced clearly and individually, in order to avoid confusion later on. The night before. If you’re having the sale at your home, make sure the grass is cut and the lawn is debris-free. Your goods will need to be are properly cleaned and priced. If it’s a combined yard sale initial your items so if they’re not sold they can be given back to the right host. Lastly, set up as much as you can the night before and get lots of sleep. Day of the yard sale. Make your yard sale super inviting by playing music. Consider serving (or selling) refreshments. Have a free box for the kids and be prepared to bargain with potential customers.